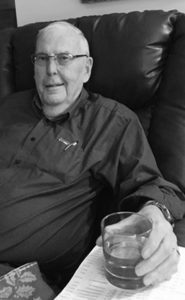 It is a very sad day for the Mears Clan as we say good bye to CHARLES “CHUCK” WALTER MEARS, loving husband, amazing father, uncle, brother-in-law, grandpa, and great-grandpa. Chuck passed away on Monday, February 4, 2019 at the age of 84 years after a brief but courageous battle with cancer and dementia. Chuck leaves to mourn his beautiful wife of 58 years, Marilyn, his daughters Debbie (Peter) and PJ (David) and son Brian (Sharon). He also leaves his three grandchildren Kailee, Travis and Chad along Christine and Melissa and three great-grandchildren Brayden, Bailey and Dylan Lewandowski. He also leaves sister-in law and brother-in law Patty and Raymond McSorley and their daughter Cari Lynn (Paul), along with numerous cousins. Chuck was predeceased by his parents Frank and Leslie Mears. Born in Empress, Alberta to parents Frank and Leslie, Chuck was raised in Fox Valley, Saskatchewan then later in Regina, Saskatchewan. Chuck enjoyed a very rewarding 26-year career in the RCMP that saw him serve in several western provinces and territories. He later worked as a petroleum land man in Medicine Hat. Chuck and Marilyn retired to Petawawa, Ontario for several years before the arrival of the grandchildren made them decide to move to Lethbridge. Chuck was the consummate family man, always supportive of everyone’s activities. He loved golf and fishing and on more than one occasion he was heard to say, “How the hell are you doing, come on in and can I get you a beer?” Chuck stayed active with volunteering with the Lethbridge Therapeutic Riding Association and the Lethbridge RCMP Veterans Association. A Celebration of Life will be held at MCKILLOP UNITED CHURCH, 2329 – 15 Avenue South, Lethbridge, AB, on Saturday, February 9, 2019 at 2:00 P.M. with Reverend Trevor Potter officiating. Donations may be made to the charity of your choice.